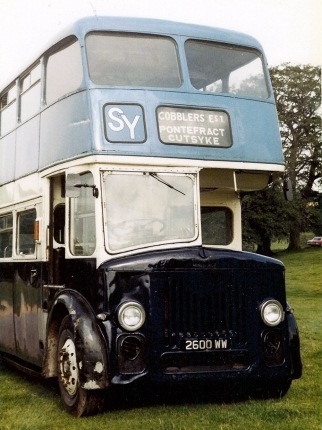 In the late 1970’s I purchased South Yorkshire Motors Leyland PD3 2600WW at the urging of a number of people who offered help in preserving this vehicle. The bus was running in service the day before I took it to where I was keeping it. I was a little naive as I thought straight out of service it must be roadworthy. How wrong could I be? I took it for a MOT a month later and it failed on 5 items rendering the vehicle dangerous to use on the road. 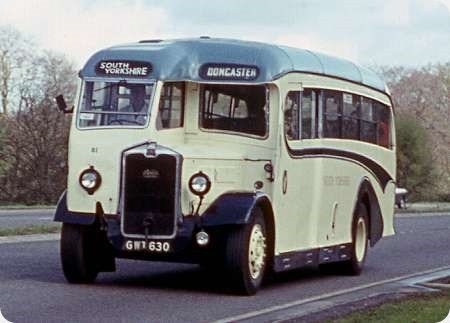 I managed to get the bus painted in the original South Yorkshire Motors colours, by this time a year had passed and so had all the willing helpers who soon disappeared when they found out there was some hard graft to do. I think all they were interested in was going to Rally’s! However I progressed with as much as I could manage by myself, until one day in the early 1980’s I was offered a sum of cash for it and away it went. It caused a bit of a topic when it was seen in a local scrap yard, I think it caused more interest as to why I had sold it than any of the time I had been struggling to get jobs done on it. I am sure I am not they only one who has been led into the false sense of believing all the promises of help and then they do not materialise. Such a sad story, Brian, but so common. A friend bought a Grey Cars Reliance/Willowbrook Viscount about thirty years ago and spent much in time and money. In the end, it was too much for one man on his own and again the scrap yard won. Makes you admire even more the chaps who manage to succeed and share their charges with us at rallies and on running days. I think we all know about "fair weather friends", Brian! At least you tried. Thanks for posting what looks to be in interesting bus with an unusual livery, albeit one I’m not that keen on. They looked good round Pontefract! There’s a clip of one of their Albions on the "sounds" page here, if I recall. What a very sad, but by no means rare, saga Brian. Its also a great pity because 83 and its twin 82 were, as far as I’m aware, the very last 30 foot long lowbridge double deckers ever produced, and were like all SYRT vehicles above average in internal appointments. I shall have to relay your story to my one time workmate Mrs. Gladys Banks of Pontefract – I still see her and many more of my former colleagues quite regularly. Gladys passed her PSV test on 83 and was a driver, a very competent one indeed, for many years before becoming an inspector. Right up to her retirement she would abandon her ticket checking at a second’s notice and would operate any busy journey, OPO of course in latter days, without a whimper and with impressive and enviable punctuality !! After the 1325-49 Regent Vs the 901 and 464 PD3s were among my STD favourites – the PD3s being highbridge but otherwise like the South Yorkshire motors (only a year older). Thank you Brian for being open about a saga that some would keep quiet. Unfortunately when your resources are stretched to the limit and you decide you need to let go of a bus, you will never find a suitable buyer. Let’s face it, realistically how many people would want buy a South Yorkshire PD3? Unrealistically, I would, as I thought they were superb machines. In hindsight I would have picked one of the Bond-bodied PD2s which were also very appealing as well as being unusual. They were by no means the last lowbridge PD3s as several entered service in South Wales later, notably the last lowbridge bus of all, Bedwas and Machen UDC 6 (PAX 466F) in 1967. Caerphilly UDC also bought a few, before turning to the PD2 for their later purchases. Thanks to every one for their comments I thought that I had not tried enough, to make it work, but it makes me feel a little better to know I was not the only one who was left to graft alone. I think that you are right Chris regarding the last 30 foot low bridge to be built. As for Gladys she used to conduct on my local service coming home from school, in the mid 50’s as Gladys Illingworth as she was then, I still see Fred Bellamy and Nelly Edwards around town. One thing that was good about SYM all the garage staff with licenced drivers and conductors, I know the duplicate on the Doncaster-Leeds route which ran from Thorp Audlin to Whitwood Tech, often had a member of the garage conducting. Thanks David B for that correction – I think I was confused regarding the last thirty foot lowbridge bodies, and SYRT 82/3 were simply the last such built by Roe. 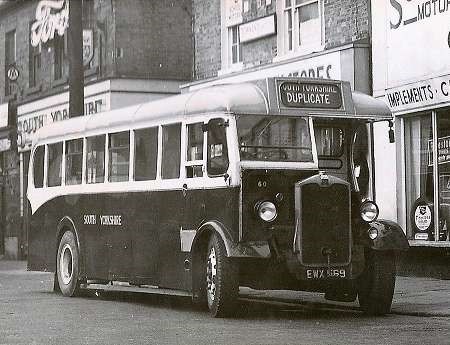 Brian, I’m fascinated to learn that you are local to Pontefract, where I spent almost fifteen very happy years with SYRT/Caldaire/British Bus/Arriva before retiring on my 65th birthday. I was once involved in the preservation of a Portsmouth Corporation Bedford OWB in the open air in a muddy yard off the A61 at Robin Hood. While we toiled away under awful conditions, hoping to reach a point where we could attend rallies "part preserved", there were plenty of "visiting dignitaries" with much verbal advice and that’s all !! I nearly blew my top one day as the season approached and a notorious pair rolled up one Saturday and, casting a deprecatory glance at CTP 200, remarked "Huh, only three weeks to the Rally – THEY’RE going to have to get out and get under then !!" "THEY’RE" consisted of me and my pal up to hilt in grease etc and we were not amused. The state visit lasted only a few minutes before the smartly clad "enthusiasts" departed. Alas, the Albion clip has gone- "taken down" from you-tube. It was shot in Dewsbury, with a trip up the "cutting". Could it be tracked down? I think I now see your livery problem, Chris H: the pic here makes the lower "Oxford Blue" look black. Chris Y & I register it in the proper colour! Although I do have colour-blindness problems, Joe, even my wife, not so afflicted, thought it was black at first sight. We both noticed the subtle difference between the black mudguard and lower bodywork. A look at the SY Albion on Flikr, showed the true colours. And you would both be familiar with the livery, whereas I’d never seen it in the flesh, so to speak! Freshly painted, it looks handsome! In answer to the colour, I did use the official SYM paint which was mixed by Masons of Wakefield, I agree that in the photograph it does look dark, but I think that there is some evening shadows on the vehicle as the photograph was taken quite late in the day. I have looked at No 81 and the lower blue seem much lighter than I remember and looking at my collection of SYM photos a number tend to differ in different light conditions. Brian, I’ve had lunch in Pontefract today with Gladys, who was quite amazed and pleased to hear that she was so well remembered. Brian – I’m sorry to have to tell you that dear Gladys passed away in June after a short illness. Independent to the last she was 83 – – a coincidence considering that she passed her PSV test on 83 !! Freddy Bellamy is still around but I don’t know about Nellie – she’s certainly been ill in recent times. Sandy – SYRT sold out to Caldaire Holdings on July 8th 1994, but West Riding did run it as a seperate unit until it finally closed in March 2003, by which time it had been owned by Caldaire, British Bus, Cowie Group, and Arriva. The vehicles and staff were transferred to Castleford aBelle Isle and the depot sold for housing and was demolished.